Allergies and Fatigue: Are They Related? Fatigue is a condition that results in an exhaustion that makes it difficult to perform everyday activities, resulting in negative consequences on daily life. Some of the possible symptoms are a lack of motivation, heavy eyelids, and irritability. 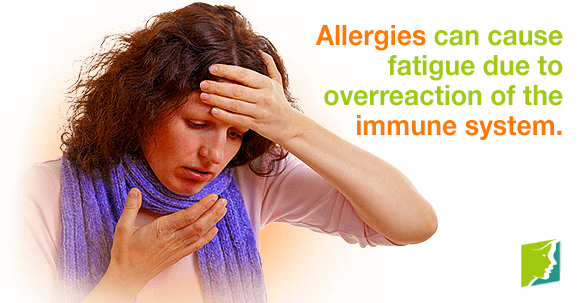 Although there are many different causes of fatigue, it is often attributed to allergies. Read on to discover whether allergies and fatigue really are related. Mold allergy is triggered by breathing in mold spores, which the body recognizes as foreign, subsequently developing antibodies to attack. Unfortunately, these antibodies are the cause of the allergy response, and from that moment on, any ingestion of mold will mean a rapid immune system reaction. Histamine is one of the chemicals produced as a result of these antibodies, and this is responsible for the allergy symptoms, one of which is fatigue. Some of the most common molds that cause allergies include Alternaria, Aspergillus, Cladosporium, and Penicillium. Unfortunately, you do not have to be allergic to mold for it to cause an adverse reaction. Fatigue can sometimes be a response to the irritants that certain molds can produce. In some cases, the volatile organic compounds and mycotoxins can induce certain symptoms in an individual, one of which is extreme fatigue. Therefore, it is important to talk to a doctor if you feel you do have a mold allergy, as it could actually be your body reacting to dangerous chemicals. Seasonal allergies most of the time are associated with summer, or maybe spring. Pollens and allergens are common in certain areas during this time, and some bodies can overreact. Many chemicals are produced to deal with this foreign substance, including histamine. This immune system reaction can often be the precursor to fatigue and disturbed sleep cycles. However, there are a range of medications on the market that can be taken for this allergy, commonly known as hay fever. As well as specific allergies being known to cause fatigue, many people can find other allergic reactions also cause tiredness, and these will vary from person to person. In general, allergies have the potential to cause fatigue because of the overreaction of the immune system, which mistakes an innocuous substance as an invader. As a result, energy is being directed away from the rest of the body in favor of the immune system. There is a very strong link between allergies and fatigue, especially in the case of certain ones. Often, people can suffer from fatigue and do not make the connection between that and a certain substance or food. With chronic fatigue, it is worth getting an allergy test, so that if it does turn out to be a result of an allergy, the substance can be avoided if possible. Read more about menopausal allergies or fatigue during menopause. Many menopausal women suffer from painful skin allergies and rashes which can affect sleep. This article explains why and how you can relieve it. Discovering that you are suffering from a skin allergy during menopause can be unexpected.It is frequent for women to see new skin allergies developing. Learn more about 4 possible triggers.